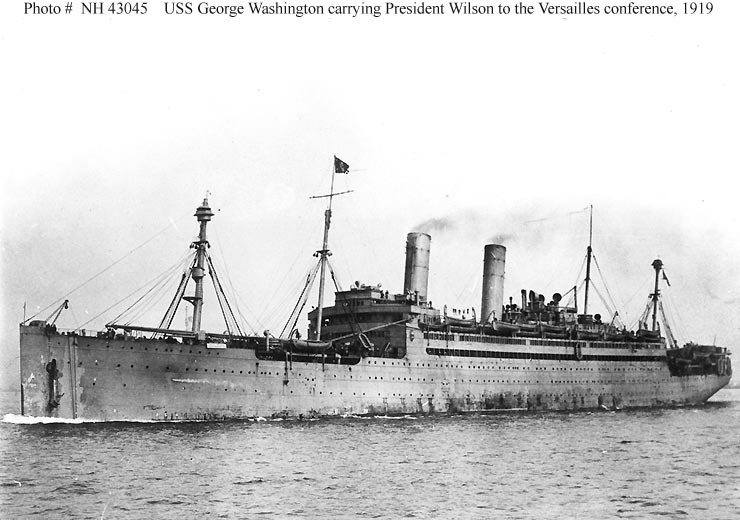 During the First World War, the U.S. Navy's Transport Force (also called the Cruiser and Transport Force) employed forty-five commissioned ships to transport American service personnel across the Atlantic to the European combat zone. 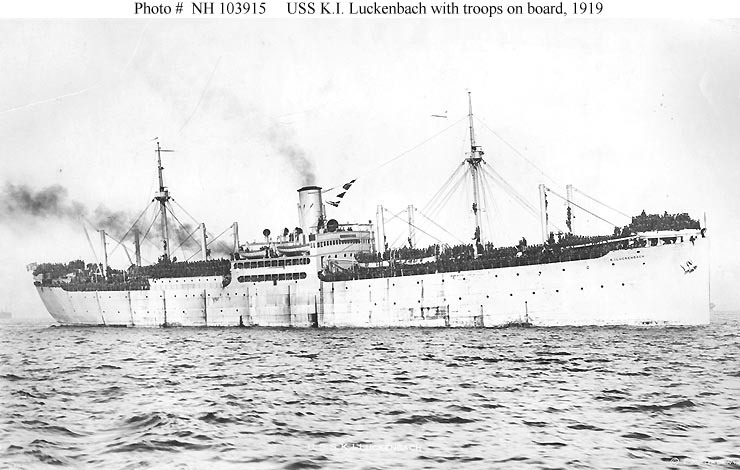 All but the regular Navy's Henderson and Hancock (later AP-1 and AP-3, not included here) were former merchant passenger liners, sixteen of them German vessels that had been laid up in U.S. ports since the great conflict began in 1914. 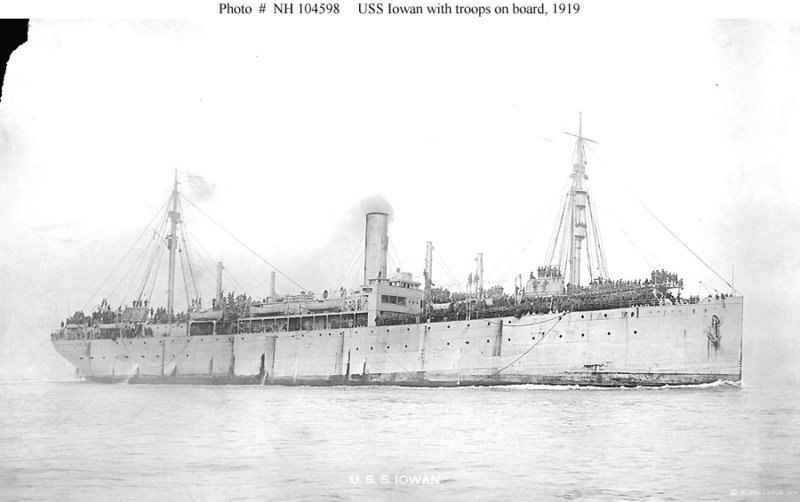 Three of the wartime Navy transports were lost during 1918, two (President Lincoln and Covington) in mid-year due to enemy action and one (Tenadores) by accident at year's end. Another (Lenape) left U.S. Navy service shortly before the fighting ended. 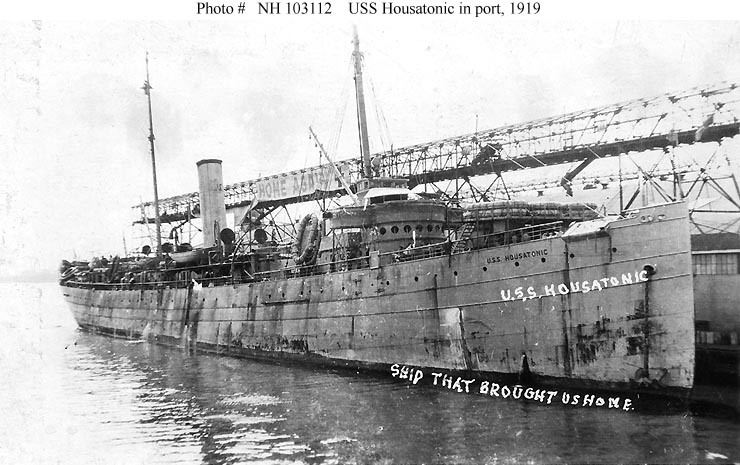 In the months following the 11 November 1918 Armistice, eighty more former merchant-type ships joined the Navy's commissioned transport force to help expedite the homecoming of the more than two million Americans who had served in Europe. 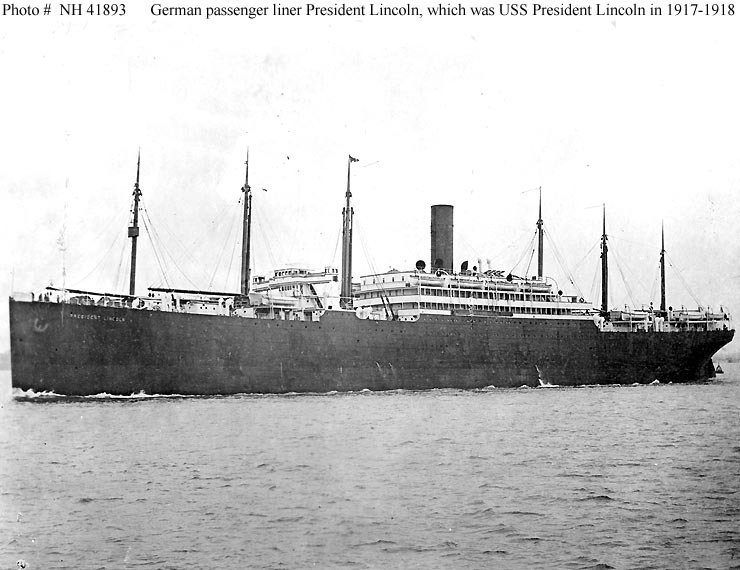 Nine of the eighty were passenger liners laid up in Germany during the conflict. 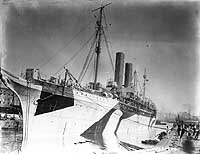 Seventy-one came from other sources, among them over twenty passenger liner types (two of them hospital ships), one coastal passenger steamer, four former minelayers and forty-five austerely converted freighters. At least four other former American coastal passenger steamers were employed carrying personnel between the British Isles and France, but apparently did not make trans-Atlantic passenger voyages. The Navy acquired two more, both former Great Lakes passenger vessels, but the fighting ended before they reached the war zone. They therefore saw no active service in European waters. This large number of U.S. Navy ships can be conveniently broken into several groups, containing between one and twenty-seven vessels. The groups are easily defined by bow shape, number of smokestacks and number of masts. The basic groups are further subdivided by additional recognition features, including variations in deck lines, superstructure size, stern configurations and the arrangement of smokestacks, masts and kingposts. Though mainly intended as a tool for ship picture identification, these groupings are also useful for analysis and understanding of the Navy's World War I achievements. Caution: Not every ship bearing the characteristics shown on these pages was commissioned in the U.S. Navy. 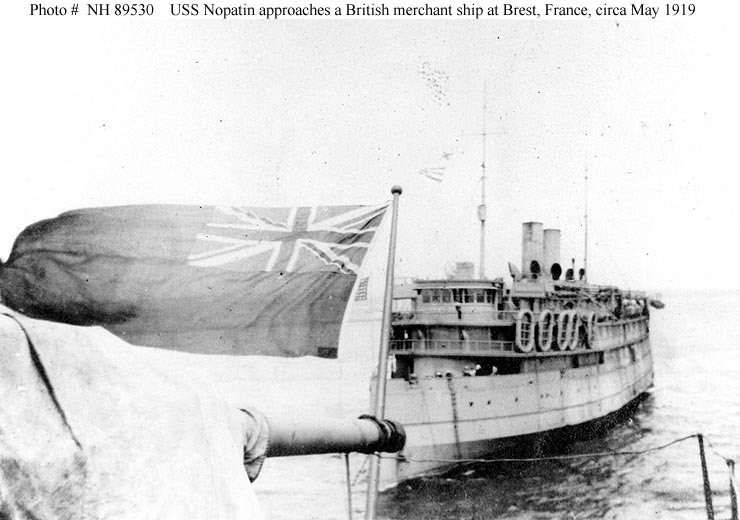 There were many World War I era ships, large and small, that were employed by the U.S. Government under commercial charter, or which operated under the flags of the United Kingdom, France, Italy and other nations. 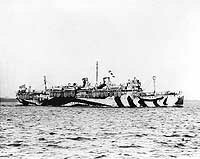 Many of these closely resemble ships that did serve in the U.S. Navy, and a large proportion wore pattern camouflage schemes very much like those carried by the Navy's ships. Approach any ship identification task with this firmly in mind. 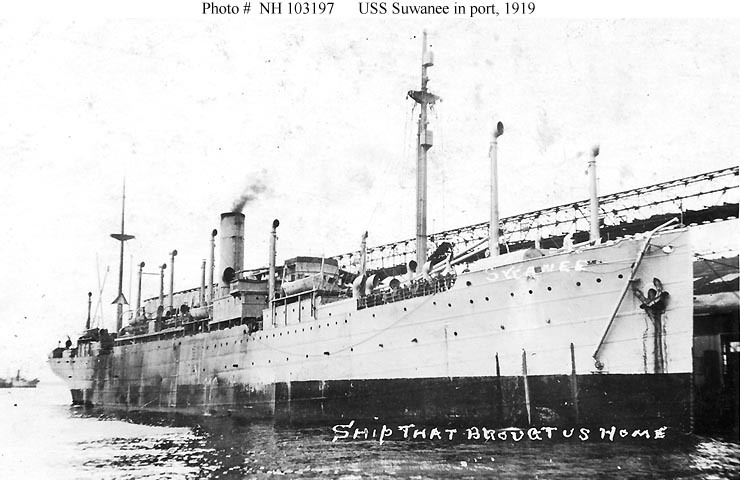 A Note on Sources: The basic listing of 125 commissioned U.S. Navy trans-Atlantic transports is taken from the 1919 Annual Report of the Secretary of the Navy, Appendix F. This extremely useful source provides statistics on the individual ships, the number of pre- and post-Armistice voyages made by each vessel, and the number of passengers transported. Tonnage (gross tons in the great majority of cases. Displacement tons for a few ships) and dimensions come from several sources. Primarily, dimensions and some tonnage data were taken from the 1918-1919 and 1919-1920 editions of Lloyds Register of Shipping. Tonnage data was also obtained from individual ship data cards. A modest amount of dimension data came from the Dictionary of American Naval Fighting Ships. 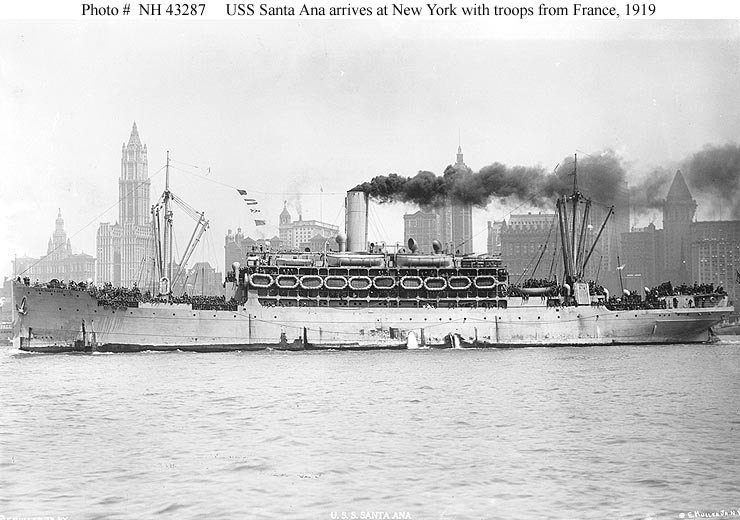 This page features a list of World War I era U.S. Navy transport groups, defined by ships' physical characteristics, with links to pages dedicated to each group of ships. Those pages provide further links to the individual ships in each group. Representative photographs are also presented for ship groups and for individual vessels. In the listings below, click the NUMBER OF SHIPS entry to access a table of the individual U.S. Navy ships with that specific group's characteristics. With a few exceptions, passenger liner type transports had superstructures occupying at least one-third of ship length and less elaborate cargo handling provisions than freighters. Superstructures might be long and low, or several decks high, and constitute a significant recognition feature. All but two of these transports had "plumb" bows. Ship sizes varied significantly, from a low end of under 5000 gross tons to more than ten times that figure, and sometimes small ships had much the same basic configuration as considerably larger ones. 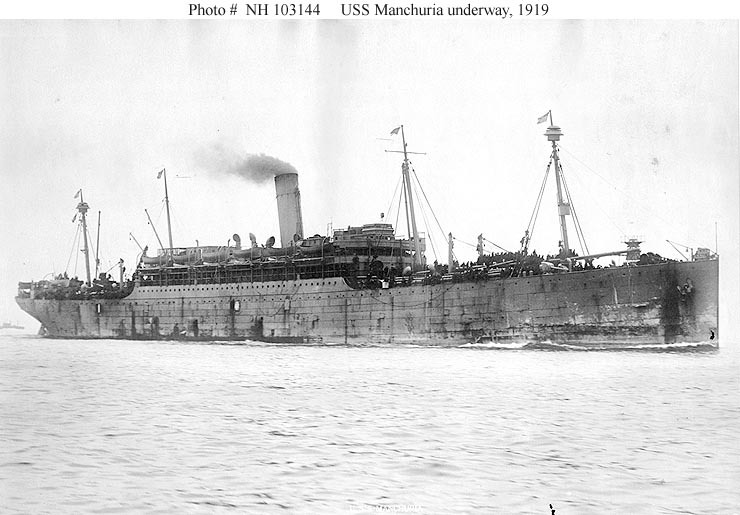 For this type of ship, number of smokestacks and masts, plus the bow type, suffice as initial identification elements. 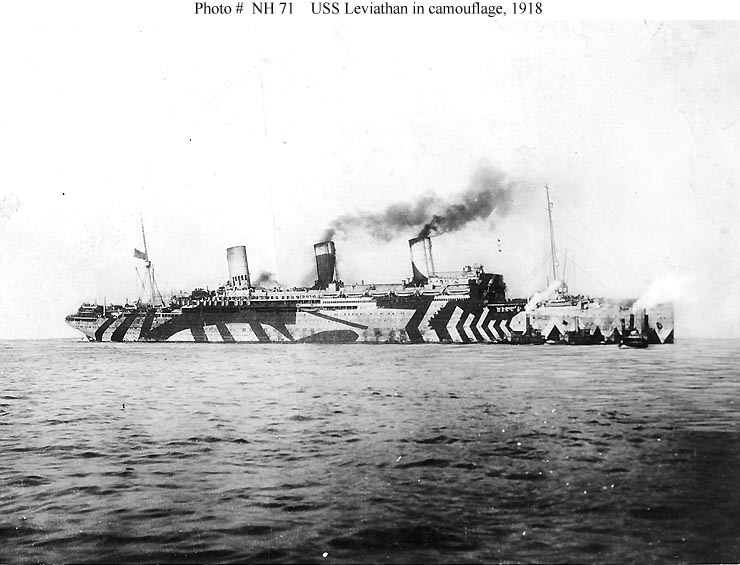 Thereafter, examination of smokestack size and spacing, superstructure and deck line features, camouflage patterns (especially in 1918 photos) and other details will help distinguish individual vessels. Remember, however, that not every ship bearing the characteristics shown on these pages was commissioned in the U.S. Navy. NOTE: Two more ships of this configuration, the hospital ships Comfort and Mercy, were retained in the postwar Navy as AH 3-4 and are not included here. NOTE: Some of these ships have paired KINGPOSTS in addition to MASTS. 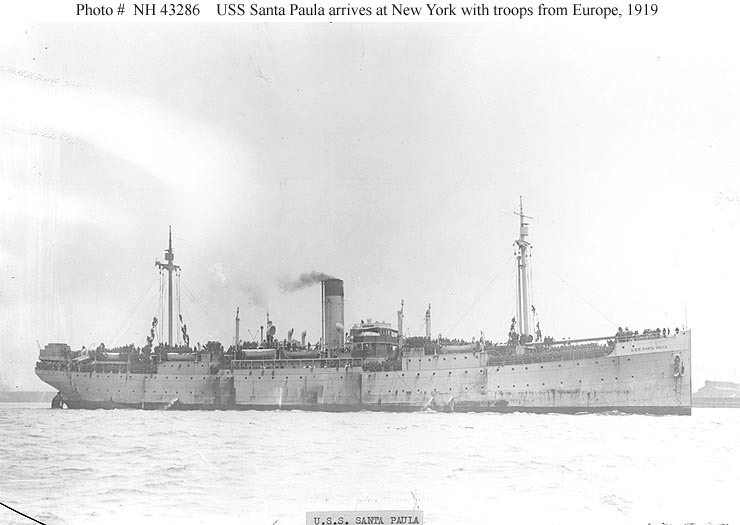 NOTE: The ships in this small group were nearly identical to each other, and rather different in appearance from the Navy's other World War I transports. 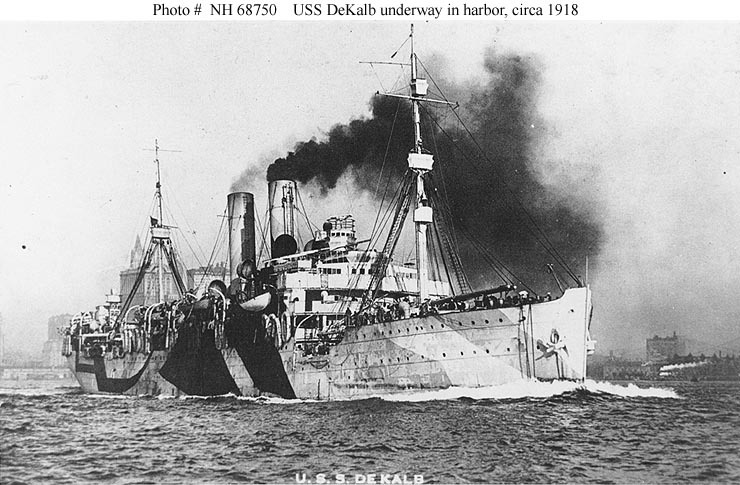 They were also similar to four ships acquired by the Navy in 1898, two of which were still in service twenty years later. The forty-five transports converted from freighters generally had midships superstructures occupying notably less than one-third of ship length and cargo handling arrangements consisting of (at the lower end of the complexity scale) a couple of masts serving several booms. However, most had several masts and kingposts. 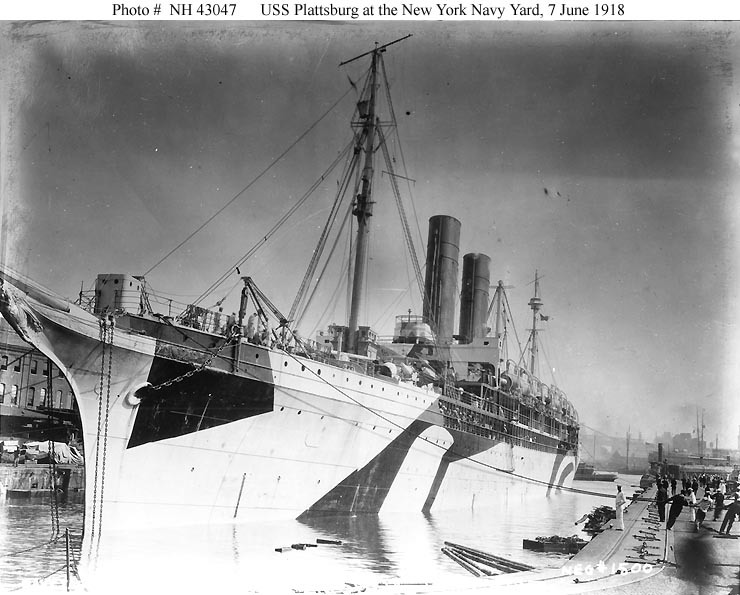 In all cases, these ships had a single smokestack and plumb bows, but stern configurations varied. 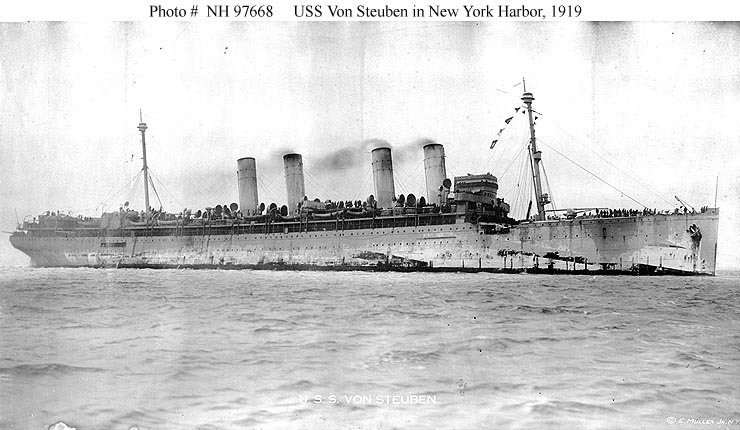 Counter sterns were most common, but several relatively new vessels had cruiser sterns. 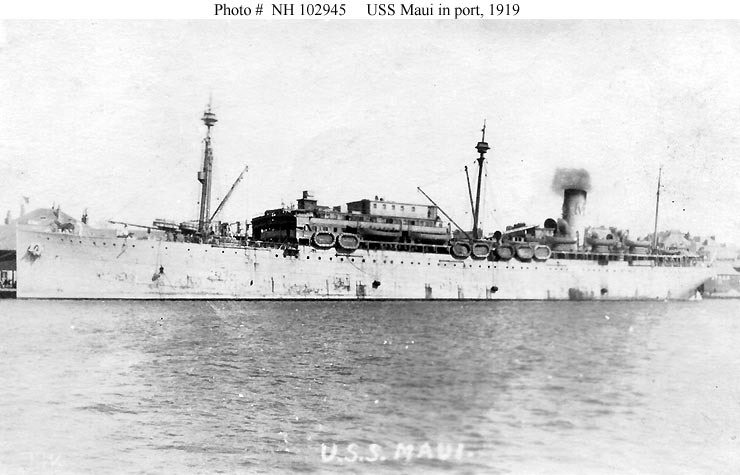 When converted to transports (primarily in early 1919), these ships usually had portholes installed in their hull sides, and received several temporary deck houses before and abaft their original midships superstructures. Some vessels, apparently previously used as animal transports, apparently had the same or similar deckhouses while so-employed, but probably did not have the hull portholes until modified to carry personnel. These ships' arrangement of masts, kingposts and smokestacks is an important identification element. Also crucial are weather deck profiles (flush-deck or raised forecastle configuration, location and size of deck-edge bulwarks) and the form of the midship's superstructure. Several of these ex-freighters had previously served as Navy cargo ships, and most had prior wartime employment under civilian operation. It will be noted that some of our photographs show them prior to, or after, their Navy service. In addition, other freighters, with the same basic recognition features, either never were U.S. 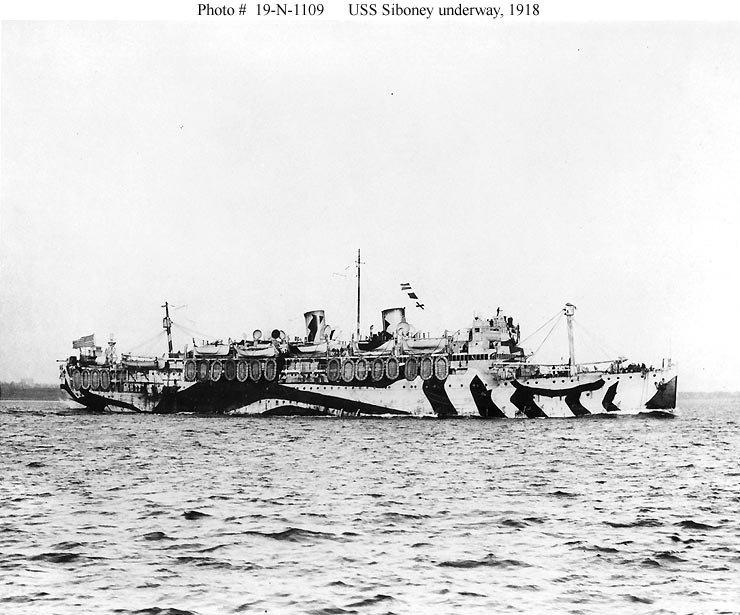 Naval vessels or only served as Navy cargo ships. NOTE: These generally had very long superstructures. The four transports were primarily used in UK-France service. Two more minelayers, Aroostook and Shawmut, were retained in the postwar Navy as CM 3-4 and are not included here.